When it comes to kayaks, Advanced Elements is a leading brand and the Advanced frame Expedition product of the company is one of the best. In fact it is rated as the Best Inflatable Kayak. The Advanced Elements Advanced Frame Expedition is one of the best kayaks when it comes to recreational paddling. Though it doesn’t have the speed when you compare it with other higher priced brands in the market, it is comfortable, stylish and comes at a very reasonable price. It is a closed-deck kayak which has a great look and some excellent accessories. Who is the Advanced Elements Advanced frame Expedition Kayak for? If you are planning an expedition or a multi-day trek, then the Advanced Frame is an excellent kayak for you. If you are looking for a study and comfortable kayak which can be used for touring purposes, then this is a great kayak for you. Since the kayak is reasonably priced, you can use it as a recreational kayak too. The Advanced Frame Expedition is really fun to use as you can maneuver it very easily. It turns very easily and responds to your steering well. The tracking is not great but it has a tracking fin that helps you to keep the kayak in a straight line. The speed of the kayak is not great since it is heavy, it is an inflatable and due to its size, however, you can paddle it comfortably and you reach your destination well. The kayak has a stern shape and a pointy bow. This allows the kayak to cut through the water rather than float on top of the water as you can see in most inflatable kayaks. This gives you the feeling of a proper kayak. The kayak is very sturdy in even the roughest of weather conditions which makes it excellent for a multi-day adventure. You can choose from either the advanced frame Inflatable package or the advanced frame Elite Package. The difference between the two bundles is that the elite comes with a drop stitch floor. With a drop stitch base, you get a main difference between the two is that the Elite package comes with the drop stitch floor. This floor makes sure that your kayak is stable and your kayak tracks better. It also improves the performance of the kayak on the water. You can choose the regular version too if you want. You can add a backbone to the kayak so that the performance improves. The cockpit area of the kayak is very roomy and comfortable. This helps a lot when you are planning a multi-day adventure. You get a snug, secure fit. The lumbar seat is basic but there is a lot of leg room. If you are planning to go on a trip for a few days, then you can add some padding or think of upgrading the seat. You can also close the front deck if the weather gets stormy. Since the kayak sits low in the water, the chance of water coming in is very high. You can also consider getting a spray skirt. Though you can tie up a lot of things on to the kayak with the bungee tie-down cords, there isn’t much in the kayak for extra gear. This becomes a problem especially if you want to go on a trip which would be for many days which this kayak is capable of. The biggest advantage of the Advanced Frame Expedition kayak is that it is very portable. You just need to deflate it, dry it out and then roll it into a compact package. You can then transport it anywhere you want in the carry bag which comes with the kayak. The Advanced Frame Expedition is an inflatable kayak that has a lot of versatility. It is definitely worth the price. The main objective of the kayak is to take you on an adventure. The lack of storage spaces hampers that though you can strap up the things to the top of the kayak. It is strong and durable and made of excellent material. It is very comfortable and extremely compact when you have deflated it. 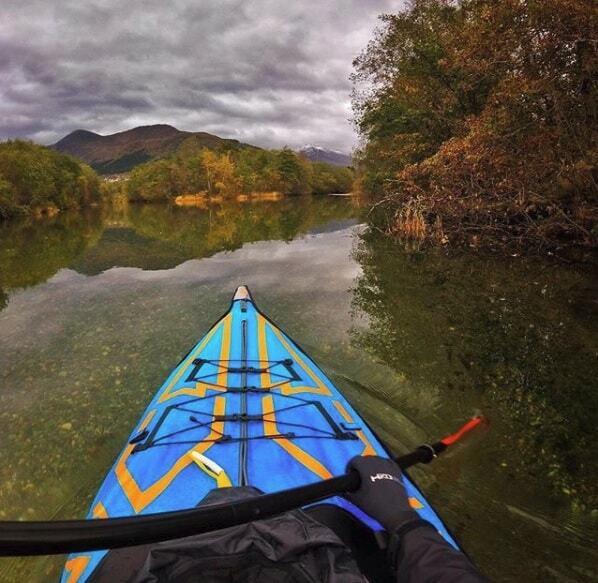 Overall, reviewers online are happy with the Advanced Elements Advancedframe Expedition Kayak. They found the kayak perfect for a large man. There weren’t any negative reviews by verified buyers on Amazon. On expert websites related to kayaking, a couple of reviews mentioned that the storage area was an issue. They also mentioned the below issues but most of the reviewers were positive about the kayak and just mentioned a couple of issues as below.